Assisted by a hardworking team, our firm is affianced in providing supreme quality array of UPVC Metal Pipe Clamps . 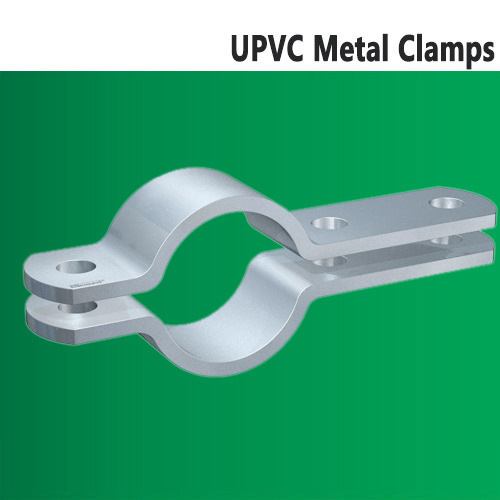 The offered clamps are manufactured at our well-advanced manufacturing unit by utilizing quality assured metal with the help of innovative techniques. Widely used for fixing in plumbing applications, these clamps are made available in various sizes and finishes. To meet the specific needs of clients, we are offering these clamps at negotiable rates. "Netra Poly Plast Private Limited", the most promising Manufacturer & Supplier was built in the year 2015 to create a presence in every industry vertical with its offered premium quality UPVC Products. Our structured business method enables us to expand our product portfolio, which includes UPVC Pipe, UPVC Elbow and UPVC Reducer. Owing to our market performance, we bring forth products with unmatched excellence and qualitative features such as, high durability, fine finish, specific dimensions, chemical resistance, light weight and ability to withstand high pressure and temperature. From construction sites to complicated pipeline fitting applications, our offered fittings spread out to the complete industrial domain in the country. Ours is an acknowledged and influential organization which endeavors for continuous improvement in the product quality with an intention to become the most advanced business entity. Further, the domain expertise of our diligent team members defined us from the rests. Our highly qualified leaders are managing the market reach by accompanying the rigorous study of the evolving client requirements and quality examinations on the procured inventory. Further, the reliable logistics companies are the foundation in our success; enabling us to produce quality products within the synchronized time frame.